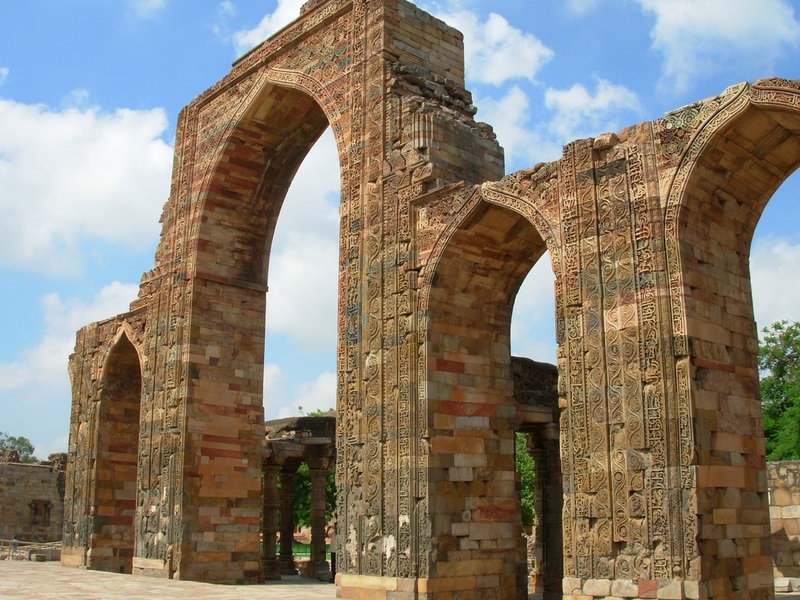 Built by Qutb-ud-Din Aibak in Qila Rai Pithora, the ancient Hindu citadel. Built on the plinth of a Hindu temple which was dismantled. The plinth was expanded to cover a rectangle of 150' X 212'. This stylobate was then enclosed by a wall with cloisters on all sides. Cloisters were three aisles deep. The western part of the cloister was the sanctuary. 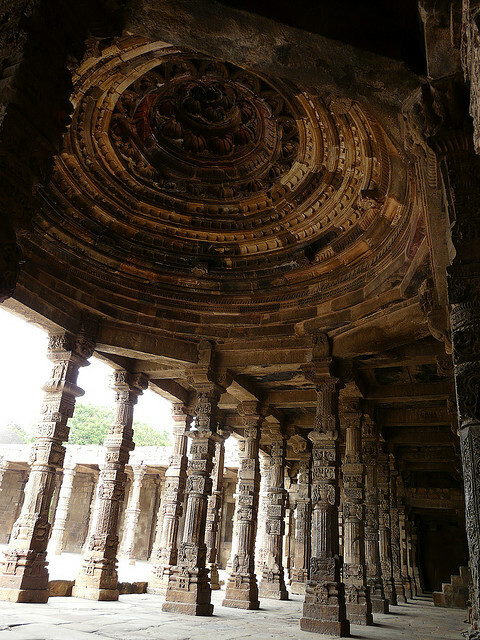 The arrangement of the pillars was made more spacious and resolved into a series of bays with shallow domed roofs. The courtyard is 105' X 141', surrounded by cloisters. In the front of the centre of the sanctuary stands the iron pillar with the Garuda motif removed from its pinnacle. In 1199, a screen of an arched facade was added across the front of the sanctuary. The screen is a wall of masonry 50' high at the centre, 108' wide and 81/2' thick. The screen is pierced by 5 arches, the central arch 45' high and 22' in span and two smaller ones on each side, each 25' high. Each smaller arch had a clerestory above it, mainly for decorative purposes as it did not serve in any way the sanctuary behind it. The facade is embroidered with carvings of floral devices and Quranic verses. The arches are not true arches but built by corbelling, hence we know they were built by local workmen acting on verbal instructions from a Muslim clerk of works. The ogee shape of the arch may be derived from the Buddhist caves of the Barahar hills of Bihar and the Stupas of Sarnath.